This is the best program if you want to encode your RealMovie (RM) or QuickTime (MOV) files into Standard VideoCD or SuperVCD files. In order for this program to work properly you must have the RealNetworks Player (RealPlayer or RealONE) or QuickTime to be installed, I would also advice to closing all other programs as EO Video is very memory intensive and may not work if not enough RAM is available. NOTE: The Pictures in this section have been edited, the "Playlist" has been cut off to make the pictures smaller and fit better in the guide, the only picture it was left is the first one, so you will understand the step, it is not required in any of the other steps! Step 2a - Click on the "Converter" button at the bottom of the program, here you can select the "Profile" which defines the "Output format" you will be encoding to. In this example, i'm going to use "MPEG" output, and under "Compression" i've selected the "VCD (MPEG1)" option. 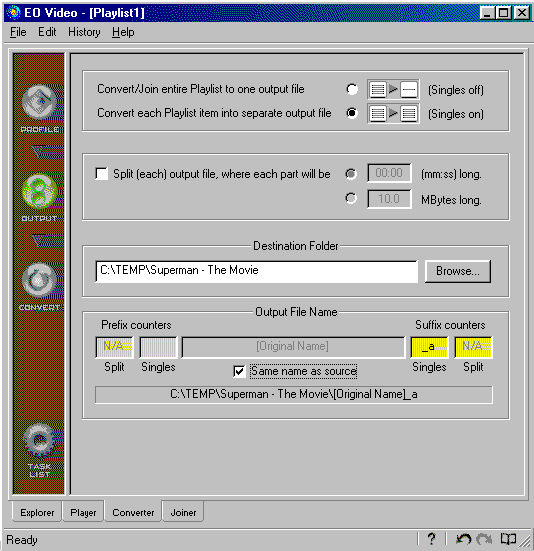 Step 3 - Click on the "Output" option on the left, if your movie is larger then a CDR capacity, you can tell teh program to encode in either a "time" selection or by a "MBytes" selection, do this by enabling the "Split" option. Then, set the program to where you want the encoded file to be saved, you can do this in two ways, either be clicking on the "Browse" button under the "Destination Folder" or by clicking on "Same name as source" which will save the new file in the same location as your original file.